Pet food maker Natura is issuing a massive recall for six of its brands. The FDA found salmonella in one product during a routine test, so to be safe the company is recalling virtually everything packaged in the same production facility, the agency says. The recall includes Innova, California Natural, EVO, Healthwise, Mother Nature, and Karma dry foods with expiration dates prior to June 10, 2014. That includes biscuits, bars and treats in every package size, for cats, dogs and ferrets. Canned wet food was not affected. Natura has a guide explaining where to find the expiration date for specific products. The company apologized and explained why it chose a much broader recall than necessary. “Our decision allows us to ensure that all products available in the marketplace were produced after June 10, the date when we implemented additional finished product testing procedures with the guidance of industry experts,” Natura says. If you purchased a product that has been recalled, you can get a full refund by filling out this form and sending it in with the clipped out barcode label and expiration date. This article was originally published on MoneyTalksNews.com as ‘6 Pet Food Brands Recalled for Salmonella Risk’. Which Is Cheaper: Cats or Dogs? Several brands of pet food are being recalled because of a potential health threat to dogs and cats. Though there are no reports of any pets getting sick from contaminated food, Nebraska-based Natura Pet Foods voluntarily recalled at least six of its pet food lines. Pets stores across the country are removing bags of dry pet food believed to contain salmonella. “Salmonella is a bacteria, and in dogs or cats, it can cause nausea diarrhea, fever or lethargy,” Overland Park veterinarian Jeff Dennis said. 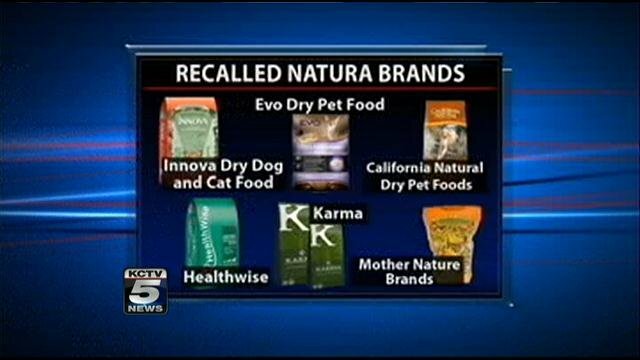 The recall includes Innova dry dog and cat food, Evo dry pet food, California natural dry, Healthwise, Karma and Mother Nature brands. They all have an expiration date before June 10, 2014. Word of the possible contamination came this week after the company reported a positive result after a routine FDA test. Davis said humans are also at risk. “Salmonella lives in the gastrointestinal tract. So if a human is handling vomiting from a pet that has salmonella, that is another means for them to be exposed,” Davis said. The company says the recalled food was produced before last week, and it was all done at the same facility. City Pets and Ponds pet store Manager Liz Largent-Vezeau said when choosing a food for a pet, it is best to use a well-known brand. “A lot of the larger names do have better quality control in place. They’re monitored by themselves and the FDA,” she said. Most of the products were sold at veterinary clinics, select pet retailers in the United States and Canada. If anyone suspects their pet has been infected, Natura Pet Products urges them to contact their veterinarian. People who own the products in question can request a refund or a voucher or contact Natura Pet by visiting its website for more information or call (800) 224-6123. Concerns over possible Salmonella contamination has prompted The Natura Pet Products company to recall specific lots of dry pet food for dogs, cats and ferrets. The contamination was discovered during a routine test conducted by the Michigan Department of Agriculture. The affected products were sold in bags through veterinary clinics, pet specialty retailers and online in the United States, Canada, Korea, Malaysia, Japan, Hong Kong and Costa Rica. spread to humans handling contaminated pet products. Product expiration dates range from 12/17/2013 through 1/2/2014. The product was distributed by Natura Pet Products between December 18, 2012 through March 15, 2013.